Today is the last day of the rapid tournament,so there are fires everywhere. Our sole leader Russian Alexandra Kostenuik played against her nearest "challenger" Katerina Lahno from Ukraine. Kostenuik showed us her good sharp form and she successfully defended her lead. 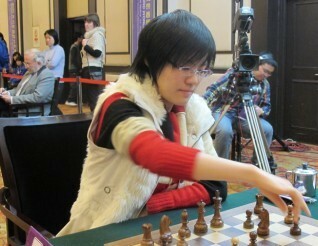 On the second board 2 Chinese players played each other.The women's world Champion Hou Yifan was a pawn up but she was not able to convert this to a win, Ju Wenjun gained a lucky draw. Nana Dzagnidze from Georgia who defeated Elisabeth Pahtz in a very complicated game, jumped to second place. Anna Muzychuk from Slovenia beat Almira Skripchenko from France,Dronavalli Harika from India defeated Armenian Elina Danielian with black. Antoaneta,Stefanova from Bulgaria and Yelena Dembo from Greece also managed to win their games.